Fairfield Career Center, part Eastland-Fairfield Career & Technical Schools, inducted 12 students into its chapter of the National Technical Honor Society (NTHS) on September 18, 2018. NTHS is America’s highest award for excellence in career-technical education. Inductees into the Fairfield Career Center chapter meet strict criteria that include being a senior, being a full-time student during both the junior and senior years, a minimum GPA of 3.5, a 97% attendance rate as a junior, and no major academic or disciplinary infractions. 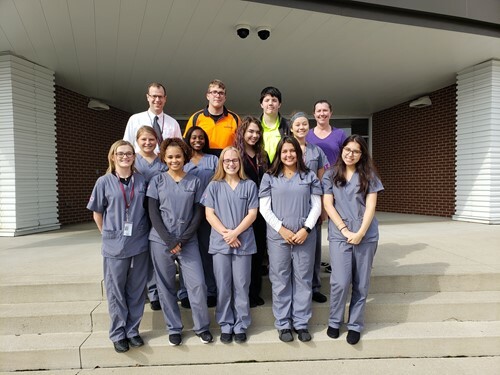 The National Technical Honor Society currently serves approximately 200,000 members nationwide and awards over $160,000 in scholarships to its members annually. NTHS honors the achievements of top career-technical education students, provides scholarships to encourage the pursuit of higher education, and cultivates excellence in today’s highly competitive, skilled workforce. For over 30 years, NTHS has been the acknowledged leader in the recognition of outstanding student achievement in career and technical education.